I used the Wilton oval pan set. The bottom layer was white cake, then spice cake, then german chocolate cake and the top layer was butter flavor. I made buttercreme icing and smoothed with Viva! paper towels. Leah designed the cake and each layer was different. The bottom was scrolls, next was dots, next layer was stripes of a sort the the top layer had more scrolls on it. Leah made the topper out of shrinky dinks! it was FANTASTIC! 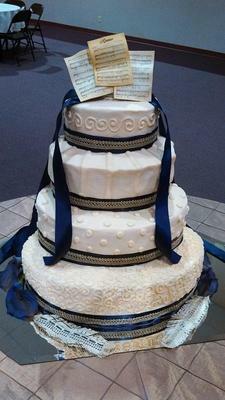 I used 2 types of ribbon around the bottom of each layer. And I put the cake on a large mirror. hobby Lobby has shrinky dinks that you can run thru your printer!!!!! They are $12.99 for 6 sheets.....but use the 40% off coupon if you have it! They are pricey but obviously worth the money, The topper was BEAUTIFUL!!!!!!! Thank you everyone for the wonderful comments!!!! I NEEDED to make this cake.....just didn't realize it until I had finished. IT IS SO BEAUTIFUL AND WHAT IS A SHRINKY DINK??? Kelley, I love this cake. The detailed design work is exquiste. Stunning, stunning, stunning! How did she use shrinky dinks? I have only seen them in things like bugs...I'm intrigued.